“Take me back to dear old Blighty, Blighty is the place for me…” Blighty Brighton, the new e-book from QueenSpark Books, is a collective memory of Brighton and Hove during the First World War including posters, photographs, pictures, songs and personal recollections. First published in 1991 and currently out of print, this digital version portrays a collective memory of the city in WWI. Photographs are central to this work, with Brighton Museum, Preston Manor and Brighton Reference Library all featured pictorially. The book also contains material including an account of a Brighton family at war from the scrap-books kept by Ellen Stanford between 1914 and 1918. These books contain letters and documents illustrating the stresses and strains of the long war on a family which had a wide circle of friends and family all involved in the war, worrying about possible German spies in Brighton and writing to the Chief Constable about it. Another focus of Blighty Brighton was the use of the Royal Pavilion designated as a military hospital, specifically for Indian soldiers wounded in France. It was felt the soldiers would appreciate the Indian surroundings. There are stories of men, recovering consciousness amid these unexpected splendours, who believed that they had awoken in paradise. The first Indian expeditionary force began landing at Marseilles in September 1914, and eventually numbered 70,000 in France. 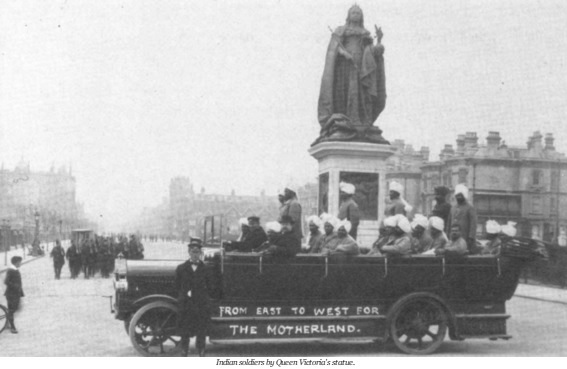 The Indian wounded evacuated to England were nursed in special military hospitals, mainly in Brockenhurst and Brighton. The Pavilion, together with the Dome and Corn Exchange, provided 724 beds, and the Kitchener, initially intended for 1,500 Indian patients, later could accommodate 2,000. The e-book is out in time for the Great War Centenary. This 91-paged book provides a valuable and important source of local history - a must for all those passionate about the city and its historical roots!